Unphotographable in Vevey, Switzerland as part of Festival Images, in "This is a Picture..." with Erik Kessels and Michael Chylinski. Exhibition and photos courtesy Gabarit. Exhibition conceived and curated by Corinne Vionnet. 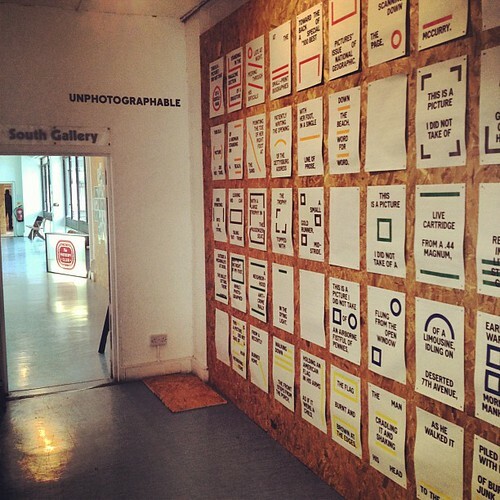 Unphotographable in collaboration with designers The Entente at Brighton Photo Fringe Festival, Brighton, England. 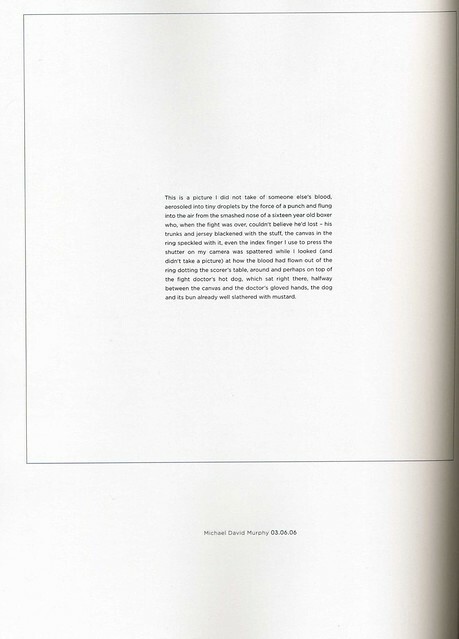 The collaboration yielded an entirely new "spin" on the source text, including a walled installation and a publication. Unphotographable in Atlanta, Georgia, as part of Atlanta Celebrates Photography, in the stateside installation of "This is a Picture...", from Festival Images in Vevey, Switzerland. Exhibition at Fall Line Press / Atlanta Photography Group Gallery. Bluebird: Narration from Josie Sutton on Vimeo. Phonar, the "free and open undergraduate photography class" at Coventry University in the UK, tackled Unphotographable this month, with students making multimedia presentations based on my text. Josie Sutton produced my favorite piece, based on this from 2007. "This is a picture I did not take of an illustration of a bluebird on a page torn from a child's textbook, nor is this a picture of the illustration as it fell from the low branches of a tree, where it had been trapped like trash beside a plastic bag, and when the page was blown from the tree, it fell to the ground slowly, the illustration facing me like a reminder of a bluebird, and when it landed at my feet, the illustration spun a bit in the wind, as if the bird knew it wasn't meant for this, and would try everything it could to flap up off that page." 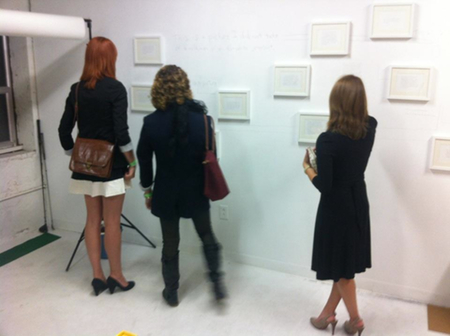 Debuting the collaboration with The Entente at Open Studios at Atlanta Contemporary Art Center. An analog Unphotographable at the Art Papers Auction. 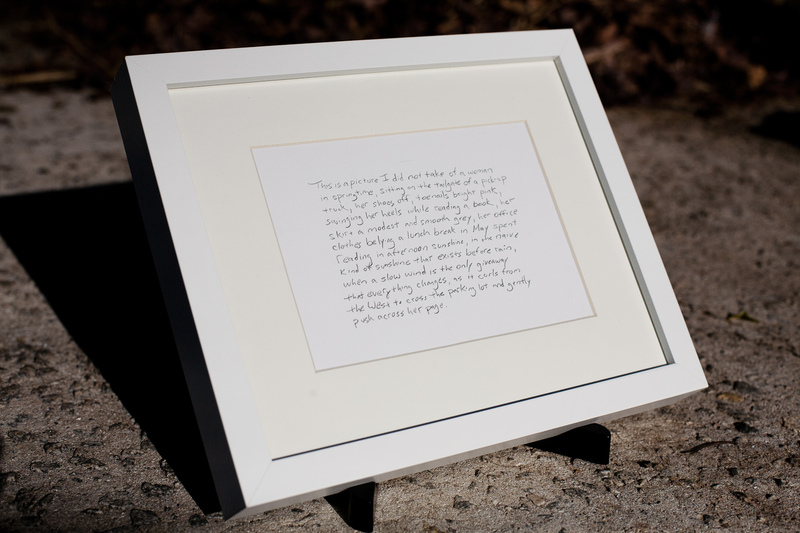 Debuting hand-written, one-of-a-kind Unphotographables at my studio. 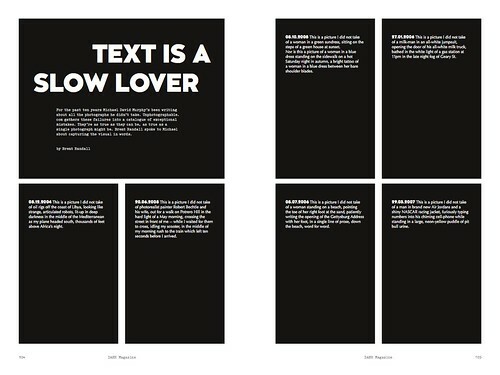 Included as curriculum for Phonar. 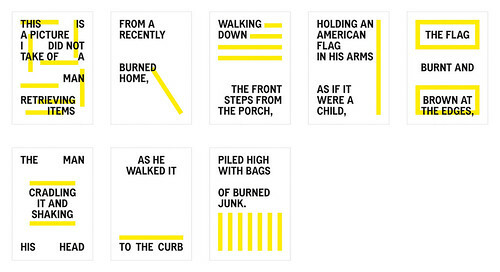 Students create multi-media projects using Unphotographable as source material. 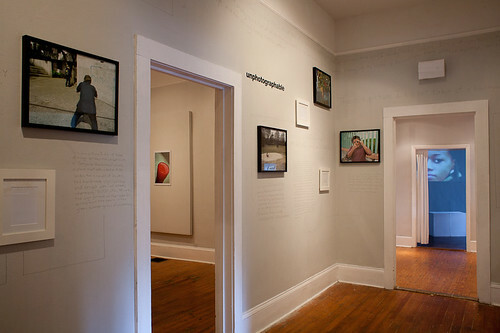 Included as part of "Certainty Principle", a solo exhibition at Spruill Gallery in Atlanta, Georgia. An exhibition of photographs, videos, and an installation of Unphotographable. actual photographs. 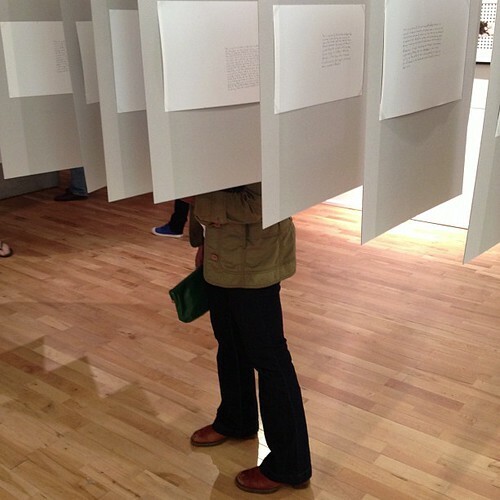 There was also an audio component where you could listen to Unphotographables while walking around the gallery. 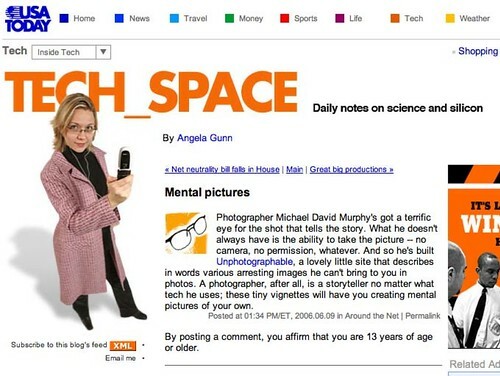 Reviewed by Jason Francisco, "Michael David Murphy explores instability of photographic truth in smart solo at Spruill." 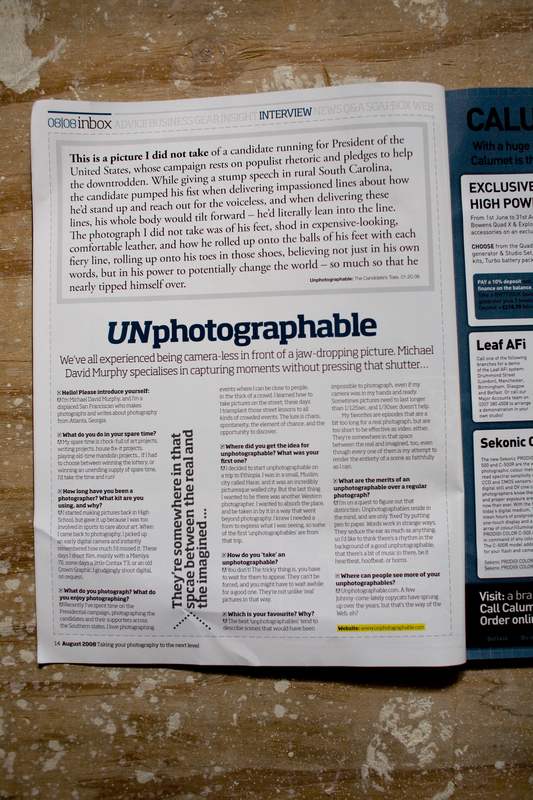 "For those new to the work, Unphotographable presents a series of writings all beginning with "This is a photograph I did not take of.." followed by a description of an incident, scene or encounter. In themselves, these vignettes are terse, often poignant, and sometimes melancholic, without the overlay of mirth in so many of Murphy's pictures. 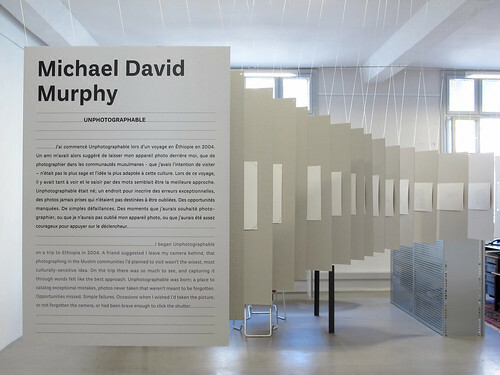 For the exhibition, Murphy has written them on the walls of the gallery in pencil in his own hand and linked each with a line to an empty picture frame, as if to underscore the conceit that the writings represent pictures we don't see. 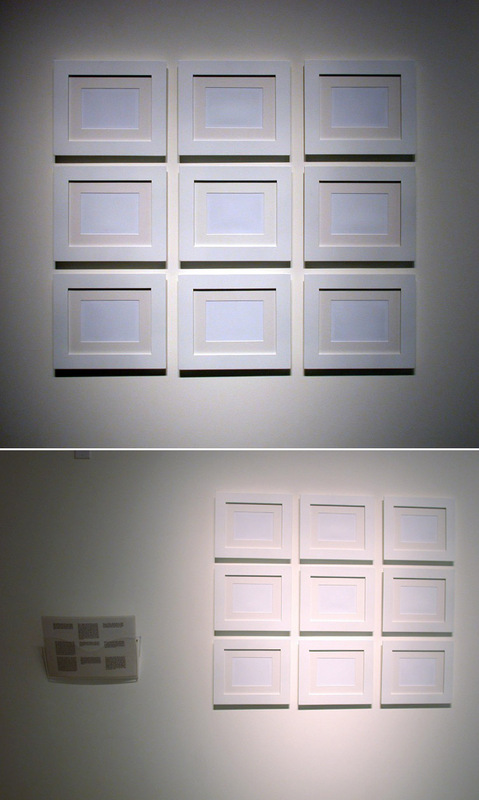 In contrast to the gridded installation in the first room, here we find a free-floating configuration in which the texts, the empty frames and unattributed photographs -- of much the same character as those in the first room -- hover around one another in a sort of weightless assemblage. We don't know whether these writings represent actual or imaginary observations, or belong in the category of fact or fiction, and this is Murphy's point. 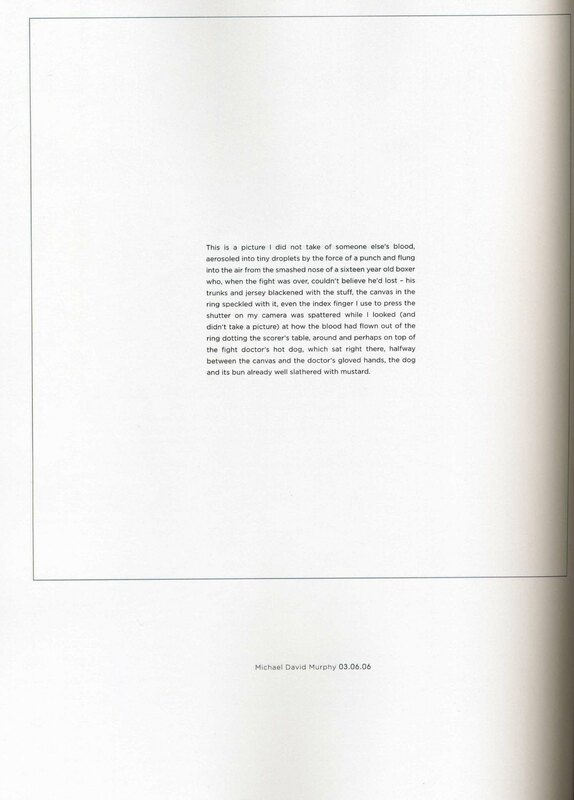 He wants to inaugurate an impossible act of transference, in which his texts displace themselves into other (photographic) forms of seeing and imagining that do not and perhaps cannot exist." "One of the greatest gifts an artist can give is to help us see our world anew. Michael David Murphy, a keen-eyed photographer and equally able writer, combines his skills to do just that in his five-year retrospective at Spruill Gallery." "Tucked in the hallway leading from the main exhibit room to a back viewing room where Michael's videos are playing ("Stoppage" is well worth the Dunwoody trip alone) are frames hung on the wall with no photograph inside. 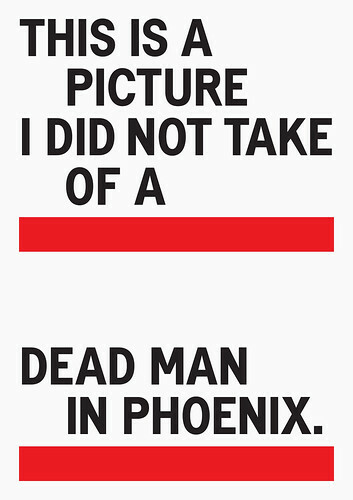 A line is drawn from each frame to a description of the photograph that was not taken. The unphotographable moment. Have I said "genius"? Many describe a scene with that has a striking social commentary, some describe a beautiful moment, and others are so hilarious I laughed out loud." "Something about Michael David Murphy's exhibition at Spruill Gallery strikes the viewer with the photographer's disarming warmth, spontaneous intelligence, and his refusal to ever stop working." Canada's "Photo Life" & France's "Photo Solution"
Now posting short unphotographables on twitter. 2007.05: "Command Z" at Torrance Art Museum, Torrance, CA. 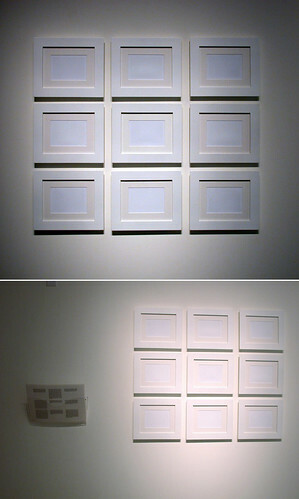 The installation consisted of a grid of nine framed "unphotographs" with a corresponding laminated gallery guide. 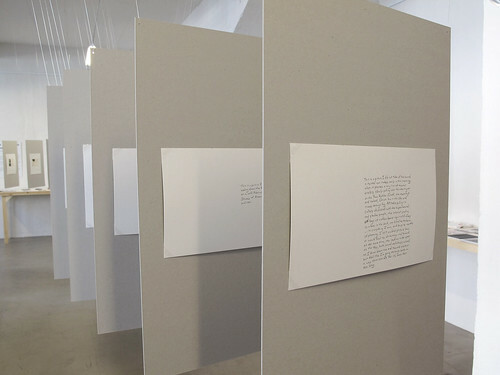 The guide supplied the text for the nine framed pieces on the wall. 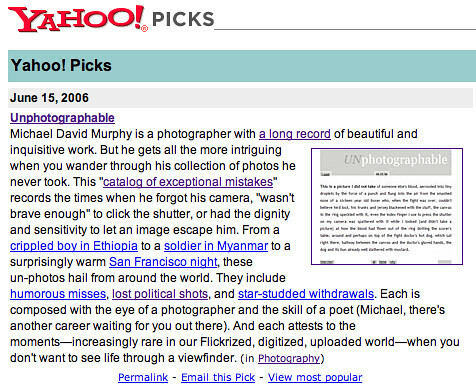 "Unphotographable is that rare thing: art that's moving and funny and thoughtful and accessible. It stirs admiration and envy in equal measure: so smart, so simple, so why didn't I think of it? And this art isn't hidden away in a gallery, but on the internet, open to everyone. Genius. Put simply, Unphotographable is the photographs that Murphy did not take, written up in direct, unshowy prose. Perfect photos... that never got taken. Perfect photos... made out of words." 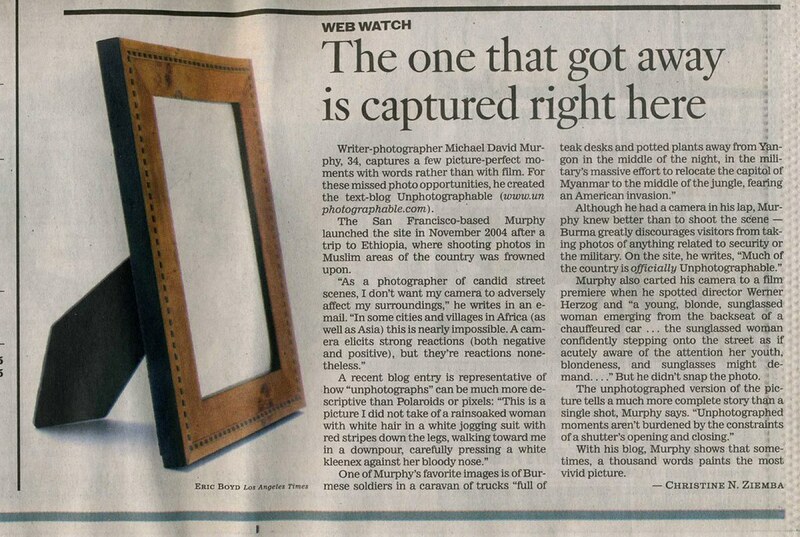 Christine N. Ziemba writes about Unphotographable in the Los Angeles Times.